Looking for a low-cost way to enjoy the fireworks this Bonfire Night? We’ve got you covered with our picks of the best free Bonfire Night events around the country. The normally sleepy Sussex town of Lewes transforms into ‘bonfire capital of the world’ every year, with seven different bonfire societies putting on five different parades and firework displays. Some societies - like Cliffe - will charge you a small fee to access their firesite, but you can watch all the displays for free if you’re prepared for a slight walk. Just head up towards the golf course at the top of town for an excellent vantage point of all the action. Do make sure you take some earplugs for you and any little ones though, as the bangers can get pretty loud! Whilst the Lord Mayor’s Show is technically not a Bonfire Night celebration, it does feature fireworks and it’s totally free. The fireworks display launches between Blackfriars and Waterloo so there’s plenty of good vantage points to catch the show. There’s a Procession and a Flotilla earlier in the day, and the event is family-friendly if you wanted to make a day of it. 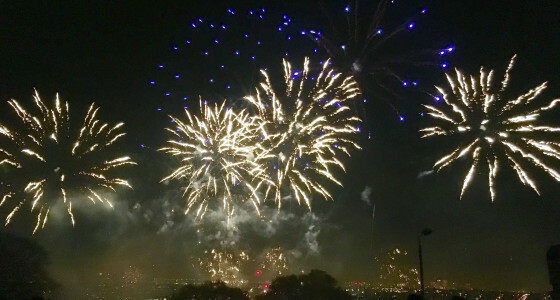 The annual Blackheath fireworks display remains one of London’s biggest, free Bonfire Night events, with the display starting from 8pm. Thousands of people come to Blackheath to enjoy the funfair and stalls during the day, and to enjoy the fireworks once the sun goes down. Leeds bonfire is one of the biggest in the north-west, with an estimated 70,000 people attending the display every year. The huge bonfire is lit at 7.30pm on Friday evening, with the firework display following shortly after. Another option in the north-west is the annual firework display in Heaton Park, Manchester. There’s a funfair for the kids in the early evening followed by fireworks later on, so it’s a great choice if you’re looking for something that’s family-friendly. The gates open at 5pm, with the event running till 9.30pm in the evening. Just over 20 miles down the road from Lewes is the (slightly) calmer option of Battel Bonfire. Guy Fawkes is said to have sourced his gunpowder from the Battle powder mills so it’s an event that’s also steeped in history. Expect processions and plenty of impressive fireworks - just on a slightly smaller scale than Lewes! Caerphilly’s firework display takes place against the stunning backdrop of the town’s castle. The display starts at 7pm but it’s sure to get busy - so make sure you get there promptly! Last but definitely not least, why not check out Aberdeen’s annual firework display if you’re based in the area? The event starts at 6.30pm, with the best vantage points found around the Beach Boulevard, Queen’s Links and Esplanade areas. Where will you be spending your Bonfire Night this year? Let us know in the comments.